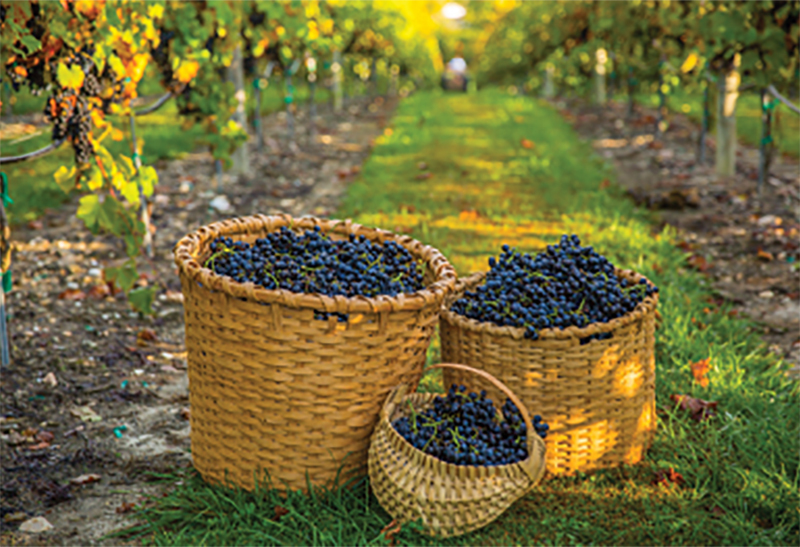 Fruits of the Vine: Embark on a tour of six distinct wine-producing regions in WNC, and find out why each of our vineyards and wineries can boast of unique and notable fruits of the vine. American Viticultural Area: AVA’s are wine-producing regions that are distinguished by their unique geography and officially recognized by the federal government’s Alcohol and Tobacco Tax and Trade Bureau. Minerality: Used to describe aroma or taste notes of wine that don’t stem from fruit, herb, or spice elements. Négociant: A wine merchant who collects grapes, juices, and/or wines from growers and markets the results under their own label. Terroir: The combination of climate, soil, sunlight, topography, and other factors that give grapes (and wine) characteristics unique to their location. Varietal: A wine predominantly made from and named after a particular variety of grape. Vigneron: A French word for someone who grows grapes for wine. Vinifera: A common European winemaking grape. Viticulture: The cultivation of wine grapes. With most of the grapes coming from a second farm in Virginia, Banner Elk Winery is less about the scenic vineyard and more about the serene acreage that surrounds the small tasting room, winery, and Tuscan-inspired villa accommodation. A still pond and lush gardens, outdoor fire pit built from large stacked boulders, and couches and a fireplace inside all lend a relaxed, rustic feel. Their California-style spin on many of the wines will satisfy anyone looking for a hearty red. What began as a tree farm on the winding two-lane road through Linville has become a getaway for many a weary traveler in need of a crisp, cool wine. Priding themselves on their mostly dry Rieslings, Linville Falls Winery also produces an array of French-American hybrids including complex grapes like Seyval and Marquette, both of which are blended to create a truly memorable dry rosé. If you’re a fan of sweeter wines, Linville Falls has a decent selection, including a blueberry wine. The 40-acre farm also grows raspberries and blueberries among its stunning spread of beautifully maintained vines. Set along the face of a steep, rocky mountain, rows of grapevines pop up between the boulders that brace the hill. It’s an easy place to pass an afternoon well into the evening, either lounging by the wide and bubbling creek or playing croquet on the challenging course that stretches through the vines. Grandfather Vineyard, like many other area vineyards, often supplements négociant grapes from California to blend with its own to make distinct wines with a somewhat familiar terroir. One of the most visited wineries in the country, Biltmore Winery is located on the grand 8,000-acre estate of late 1800s tycoon George W. Vanderbilt. It’s easy to get lost in the dozens of house-made wines available for sampling, but be sure to check out the winery’s méthode champenoise sparkling wines. Their Blanc de Blanc has been famously served as the bubbly at several White House dinners. Sign up for the Vine to Wine specialty tour that offers a glimpse of the vineyard, which isn’t open to the public. In an effort to preserve their fourth-generation farm, the Frisbee family decided to grow grapes and make wine in lieu of maintaining the increasingly costly cattle farm. On weekends, the Frisbees welcome guests to the mountaintop tasting room to sample their hand-harvested and homespun Cabernet Sauvignon and Cabernet Franc, among many others. Just a short drive from downtown Asheville, it’s an easy way to escape the hustle and bustle of the city for a quick afternoon break in the vineyards. Founded by a couple of former restaurateurs in 2006, this tranquil north Buncombe County getaway boasts both a vineyard with nine varieties of grapes and several event spaces that court wedding clients. Of note is the French-style wine cellar and gourmet wine tours that Fontaine hosts by reservation. Once an apple orchard, this 27-acre vineyard produces 13 varieties of European and French-American hybrids, including an award-winning Grüner Veltliner. As one of the few wineries in the area with accommodations on-site, you can rent the Vintner’s Cottage and spend the night on the vineyard. This small, family-run vineyard stretches just off the deck of the homey tasting room and sprawling, trellised stone patio surrounded by Yoshino cherry trees, and makes a perfect spot to enjoy the crafted rosé, a crisp, dry wine made of Cabernet. Be sure and make it for their Sunday pizza day, with scratch pies baked by the owners in their brick oven. From a seat on the hammock swings in the yard, just over the crest of the vine-covered hills, you can spot the namesake chapel of this entrancingly beautiful winery. Transplanted from owner Andrey Medvedev’s home in Russia, the small place of worship makes for a great spot to soak up a sunset and enjoy the array of Bordeaux-inspired wines. The standout Sauvignon Blanc is a sure sip not to miss. Overmountain is named for the nearby pass through the mountains that Revolutionary soldiers trekked to join the 1780 Battle of Kings Mountain. With regular weekend events and local food, it’s a great place to have a glass after heading out on the Overmountain hiking trail in the hills surrounding the winery. The wines revolve around French styles with an emphasis on whites, with Petit Manseng being the main focus. This vineyard is as welcoming as its wine bar: The laid-back tasting room is a perfect place to open a bottle from the varied spread of seasonal options (be sure to try the Vidal Blanc), meet local regulars, and enjoy the Great Food for Any Mood food truck, which dishes out gourmet burgers, shrimp tacos, veggie wraps, and more on weekends. Saint Paul truly feels more like a neighborhood bar than a winery. Originally founded in 2002 as a négociant to sell grapes to other winemakers, Mountain Brook recently started producing its own wines. After launching with a citrusy oaked Chardonnay, the vineyard has expanded to include Pinot Grigio, Merlot, Cabernet, and a Bordeaux-style blend. The winery has great views of mountain peaks, as well as hiking trails throughout the surrounding hills. This picturesque vineyard produces European and French-American hybrid wines. Unique to the winery is its Chardonnay Rosso, a red wine made with Chardonnay juices fermented on the skins of Chambourcin grapes. It’s off-kilter and outside of the box. Though this small family-owned vineyard offers pick-your-own grapes and specializes in selling home winemaking equipment and supplies, Valley River also pours its own wines. Varieties come from European vinifera grapes, French-American hybrids, and American grapes like Muscadine and Scuppernong. While it’s the smallest winery in the state, there’s a lot packed into this building that once served as the town’s jail. The 300-square-foot space houses the winery and tasting room for French-American hybrid wines as well as beers from the owners’ brewery, Andrews Brewing Company. Occupying a former bus station in downtown Murphy, Cherokee Cellars bottles wines with grapes from North Carolina and Georgia, with an emphasis on native and hybrid cultivars, along with a hearty selection of French grapes. While it’s open only from April to December, it’s well worth a visit during those months to take in the wine selection, tasting room, and wine-themed gift shop. If you listen carefully at this vineyard, you can hear the lilting tones of the classical music that’s played to “wake” the vines every morning, a technique the winemaker picked up while studying in Italy. With a range of sweet and dry wines from which to choose, and even a wine slushy churning in the blender, there are plenty of options for you to sip while you listen to the grapes’ serenade. With grapes from its vineyard in the nearby Snowbird Mountains, along with other area growers, FernCrest evolved from Kurt and Jan Olson’s experience as small-batch home winemakers. Now, its award-winning wines, which are all named for ferns, include the Southern Lady (a dry white made with Chardonel grapes), the Mountain Wood (a dry red made from Cynthiana grapes), and the Fiddlehead (a sweet red blend), among others. A nice selection of local cheeses, jams, and condiments makes for a splendid accompaniment. The breezy mountainside of the Thompsons’ family estate and winery makes a perfect spot to fly a kite—they offer an array of them to choose from in the tasting room—or to just sit with a glass of crisp, clean Riesling and watch the wind play in the leaves of the vines. 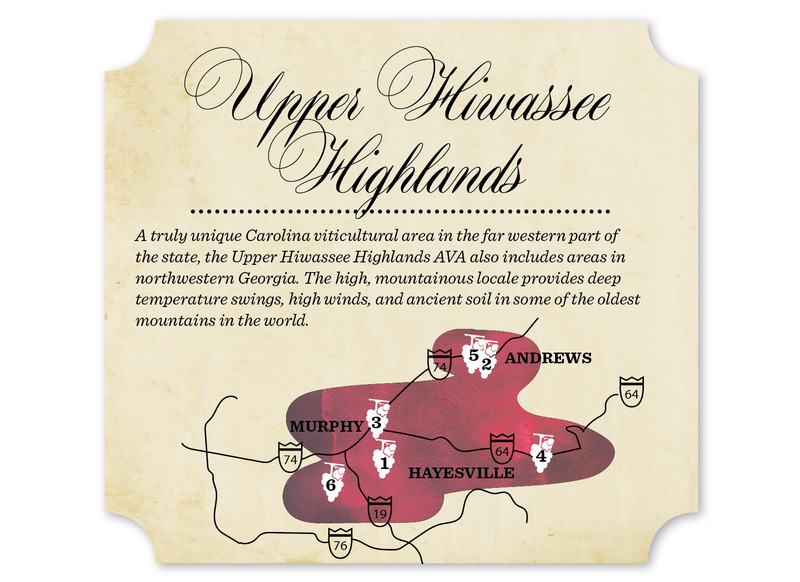 This is one of the Upper Hiwassee’s only vineyards to specialize in European vinifera grapes, and their War-Woman Red, a blend of Cabernet Sauvignon and Cabernet Franc that’s named for the owners’ family ties to Cherokee leader Nancy Ward—speak to old-world, classic European-style wines. Winding up the narrow gravel driveway, you hardly expect to find this rustic, century-old farmhouse and vineyard growing Bordeaux grape varieties. South Creek also hosts a regular Vineyard Deck Music Series, with eats from local food trucks and featuring regional pickers and players of everything from folk to blues to swing. Specializing in French-American hybrid varietals like Chambourcin and Traminette, Belle Nicho was actually inspired by the owners’ visit to neighboring South Creek Vineyards & Winery. With a strong effort to strip away pretension, the tasting room is decidedly relaxed, with a healthy dash of southern charm. What began as a purely commercial vineyard was turned into a winery nearly eight years ago, and Silver Fork has been producing everything from Chambourcin to Cabernet Franc ever since. With a view of mountain peaks and rolling pastures from the patio, you can sink into a bottle and enjoy tunes from local bands on the weekends or a Sunday brunch from the Farm to Fork food stand. In the middle of this vineyard sits a big red barn where Twisted Vine doles out everything from Malbec and Shiraz to its selection of sweet fruit blends. There’s also a jalapeño wine that isn’t for the faint of heart. The vineyard regularly presents picking on the porch, featuring local musicians. With an array of styles of wine both Vitis vinifera and Vitis rotundifolia, this family-run vineyard produces sweet muscadine wines and classic varietals like Cabernet Sauvignon and Sauvignon Blanc. It also utilizes local fruits to create blueberry, blackberry, raspberry, apple, and peach wines. In the works since 2013 and opened in early 2016, this family-owned vineyard produces nine of its own wines, all of which can be sampled in the tasting room or on the patio overlooking a farm pond. Shadow Line is focused on its wines but doubles as an event space for picnics, weddings, receptions, club outings, and assorted other get-togethers. One of the more unusual wineries in the region, Lake James Cellars adjoins the owners’ expansive antique store. And as you’re swirling your glass and perusing the vintage flatware, just beneath your feet, the winemakers are hard at work making your wine in the cellar below. With everything from a dry Traminette and Barbera to a sweet Riesling and fruit blends, it’s worth testing the range of options. If you’re looking for Carolina heirloom wines made from cultivars including the region’s so-called Mother Vine, look no further than Waldensian Heritage Winery. 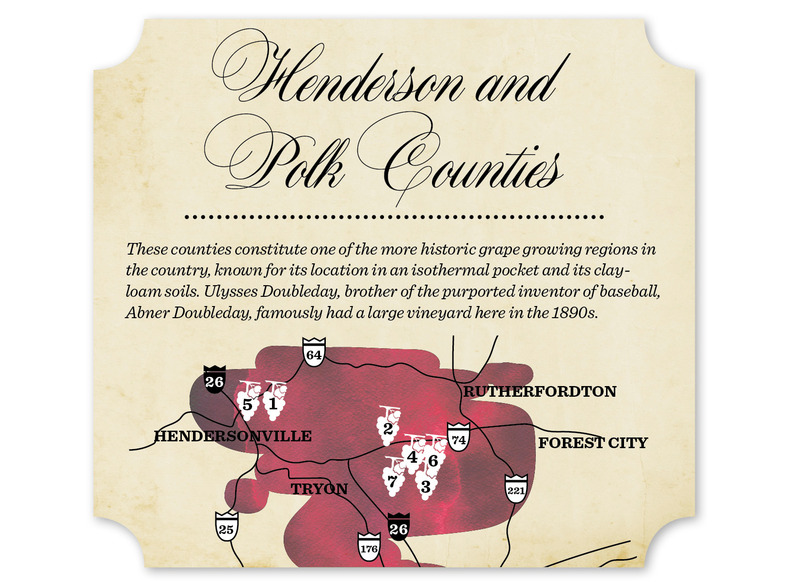 Specializing in Scuppernongs and Muscadines, their wines tend to lean toward the sweet side. Waldensian claims to be the oldest winery in the region, having been crushing grapes since 1930. As soon as you pull up the driveway, the owners’ darling dogs come running to greet you on this 30-acre hillside vineyard and apple orchard. Offering more than just some of the area’s most consistent wines—the dry Muscat and Ring of Fire Merlot blend of Sangiovese and Petit Verdot are not to be missed—McRitchie also serves some of the region’s best hard cider. There’s a casual, front-porch vibe to the winery, with a homey, relaxed tasting room inside an old house. This is one of the only wineries in the state to focus on Spanish and Portuguese varietals like Albariño, Vinho Branco, and Tempranillo. The picturesque vistas of the 48-acre vineyard make this a great place to picnic, and in certain months they even do a bottle discount for those looking to dine al fresco. Within its first year on the scene, the Jones von Drehle winery swept the Asheville Wine & Food Festival with a slew of gold, silver, and bronze medals, and it has continued to dominate the region in terms of consistency and quality. The tasting room adjoins the winery, and tours are offered regularly by winemaker Dan Tallman, a 30-year veteran of the trade. It’s hard to find words to describe this sprawling, 120-acre vineyard and gardens, or even the massive Italian villa of Raffaldini’s estate, with anything other than clichéd terms like “breathtaking” and “sweepingly romantic.” But those words are undeniably apt for this gorgeous winery that has become a fixture of the state’s wine scene. Specializing in Italian red varietal blends, this is one of the only wineries in the region to utilize the appassimento method of incorporating dehydrated grapes to create a deeper flavor in their reserve wines. Sourcing most of its grapes from California, and thus not included in the AVA, Thistle Meadow is able to make nearly 60 varietals of wine every year for blending and bottling. Its lengthy tours go through the entire process of winemaking, and tastings cover a wide range of dry European-style wines as well as blush fruit blends. Just down the hill from Raffaldini sits one of the valley’s newest vineyards. Piccione (meaning pigeon) specializes in classic Italian varietals, like a citrusy Pinot Grigio or Vermentino. The winemakers also claim to be the only producers of Negroamaro on the East Coast. Don’t let the temporary tasting room deter you, Piccione—much like the humility in its name—is serving some of the most unique and deeply soulful wines in the state out of a double-wide trailer. Perched high above the Roaring River, this vineyard’s isolated covered patio lends views of the ruins of an old water-powered mill. There’s a little bit of everything for the palate, with a mix of traditional wines and French-American hybrids, as well as beer and cider. There is also a small kitchen serving paninis, cheese, and charcuterie plates. Tip: Most local wineries sell only on-site. North Carolina wine expert Peter Fland recommends vinoshipper.com, a website where you can buy direct from many smaller wineries nationwide. 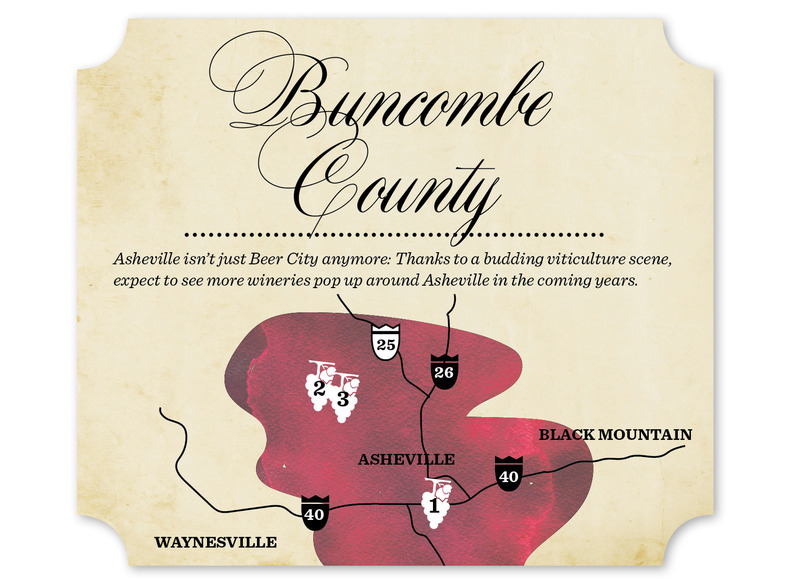 Wine shops and tastings abound across Western North Carolina. Here are eight opportunities to help you get started. The state’s diverse ecosystems and microclimates allow for a wide range of grapes to flourish. In the mountains, with the heavy humidity and frequent rain, farmers stick to hybrid vines that crave moisture, but as you get closer to the Piedmont, the native rotundifolia varieties thrive in the red clay, while in the highlands and foothills, European grapes reign supreme. Both the southeastern native rotundifolia species like Muscadine and Scuppernong and the northeastern labrusca varieties like Catawba, Concord, and Niagara have deep roots in American viticultural history and produce rich and unique flavors in Western North Carolina wines. Muscadines and Scuppernongs typically originate from eastern North Carolina’s “Mother Vine,” an ancient monster vine on Bodie Island first documented in 1584. With over 10,000 varieties in existence, the Vitis vinifera species of grape is by far the most familiar for most wine drinkers. It’s the species of Cabernet Sauvignon, Malbec, Chardonnay, and Sauvignon Blanc. And just as this diversity brings myriad flavors, vinifera grapes thrive in equally varied growing conditions. 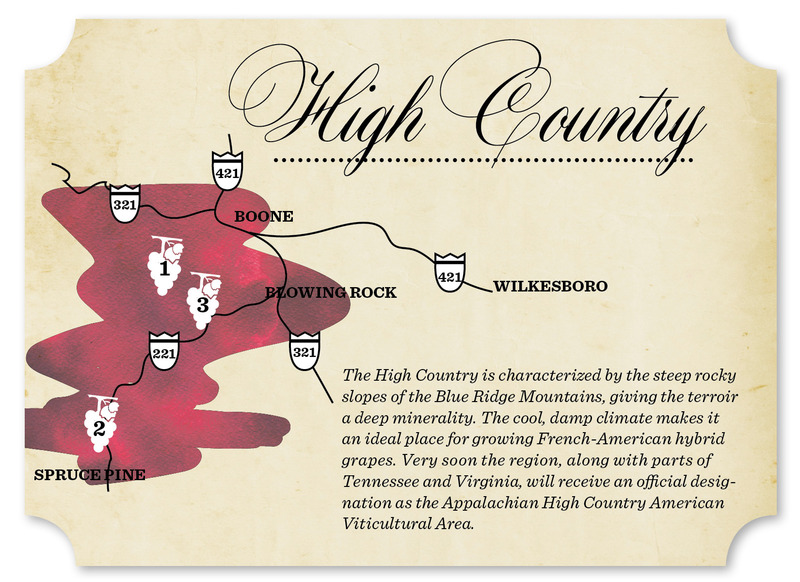 WNC presents different climates, some of which are prime for growing European-style grapes, while others are more inclined for Italian styles. Developed in central Europe as a way to combat the phylloxera infestation that destroyed most of the European varieties in the late 19th century, these cross-species breeds have found a home in the rain-laden mountains of WNC. These hybrid grapes, like Chambourcin, Seyval Blanc, and Vidal Blanc, produce flavorful wines that exhibit all the qualities of a European variety but yield to the Carolinas’ unique terroir. Maybe you’ve seen their name mentioned around local wine events. The French Broad Vignerons is a group of vineyard and orchard owners and developers, beverage producers, and others with a shared love for North Carolina wines and ciders. “‘Drink Local Wine’ is really getting to be a strong phrase for us,” says the group’s president, Peter Fland. The organization holds tasting events to help members develop their palates and evaluation skills and also operates and judges local wine and cider competitions, all serving to bring greater attention to North Carolina wines. To learn how to become a member, visit www.frenchbroadvignerons.org.